Our friends at Blue Rock Station near Gaysport, Ohio are holding one of their rare "open houses" this Saturday (June 20), which will begin promptly at 1:00 PM. For those of you who do not know, Blue Rock Station is the home of Jay and Annie Warmke which includes several buildings that have been constructed completely out of natural materials and recycled items (tires, bottles, cans, glasses, etc.). Blue Rock Station also serves as an excellent workshop for natural gardening, common sense sustainability, and other great strategies for harmonious living. For more information on Blue Rock Station, please visit their website. Jay and Annie have approximately 3,000 people tour their property every year -- and they are understandably selective about when they open up the Station to tours. 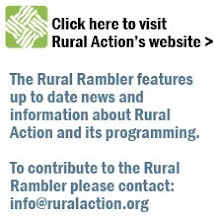 If you've never heard of them, or if you've never been out to their property before, we at Rural Action highly recommend it. The cost is only $5.00 (with an option for "high tea" for an additional $2.50), and it'll be money well-spent. Reservations are necessary, so if you are interested in attending, please contact Annie Warmke (annie@bluerockstation.com) to reserve a spot. You can find directions to Blue Rock Station here.